In most reflexology traditions a reflex for the spinal column is depicted on the medial side of the feet, and the spine is mostly worked on the inside of the feet. Because the spine is a central structure in the body, the spine reflex is divided into two with one half on each foot. Therefore, working the reflex on the inside of the foot corresponds anatomically to be working inside the spine, which is the spinal cord. Through the history of reflexology, this has been shown to be an excellent place to work, perhaps partly because thereby we affect all of the spinal nerves and the huge body area they innervate. But in our experience, one can get even better results by using a more three dimensional view on the spine reflex and work the full width of the spine. Spine is indeed quite wide. Across the transverse processes it measures just over a quarter of the body's width. We transfer this fact to the feet and extend the common medial spine reflex with both a plantar and dorsal area. The exact location is easily imagined in the thoracic spine corresponding to the metatarsus. If we reserve the fifth metatarsal for the shoulder/arm reflex, then just over a quarter of the rest fits very well to the width of the first metatarsal. This is the principle behind our placement of the "broad back". 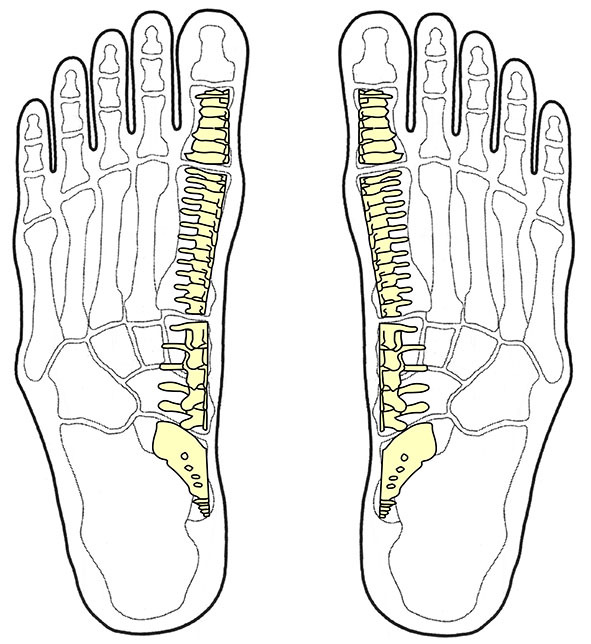 This is our starting point and the mental image we consciously focus on when treating the spine, but we also believe reflexology has an "x-ray" effect in the sense that the effect penetrates into the depth, so that in practice we can treat both the front and back of the spine from both sides of the foot. The same principle applies to all reflexes. The widest point of the spine is the upper part of the sacrum. We place the sacrum reflex equivalent to the talus and follow the bone as we work quite a distance away from the medial edge of the foot. In Touchpoint’s “Round about: The Spine” workshop, among many other subjects, we show seven different techniques for working with the spine reflexes.